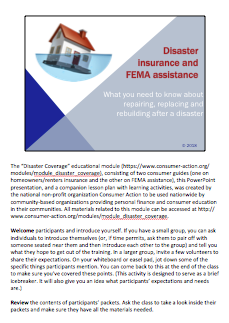 This downloadable PowerPoint presentation is designed to be used in conjunction with the “Disaster insurance and FEMA assistance'” lesson plan. The slides provide a visual component to the training that helps to engage learners and improve retention. This guide was created by Consumer Action’s Insurance Education Project.